This song by Asaph voices a communal lament for the defeat of Jerusalem, seeking safety and justice until the people can “give thanks forever from generation to generation”. It’s another “How long?” song, themes taken up by many song writers including Canadians Steve Bell and Linnea Good. The psalter is riven through with songs of the blues and forbearance — at least ten of them, such as Psalms 6, 13 and on through to 119, include this anguish. Kumbayah is fine. But far away in another galaxy, one Clemens non Papa wrote a nice four-part setting called Domine, ne memineris / Adjuva nos, from the first and ninth verses. Non Papa? How would you like to go down in history as “Not the Pope” just to make sure we knew who you were? The Belgian composer Jacobus Clemens (c. 1515-55), who worked mainly in Bruges and Paris, is known for his psalms in French and particularly Dutch. 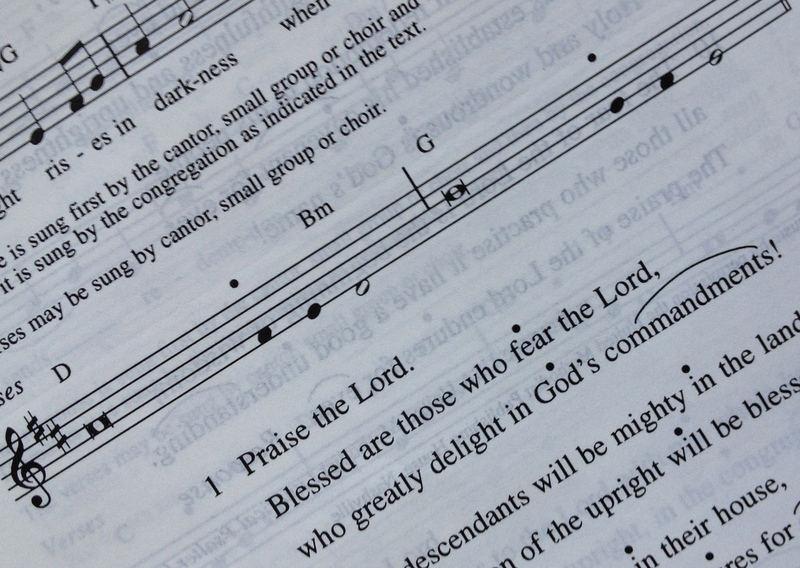 In yet another world, the Anglican church has a great tradition of chanting the psalter in a particular style that is a satisfying evolution of ancient Gregorian tradition into more recent polyphony. It uses, as many of us do, verses with pointing markers as clues for fitting the words into a chant. Our practice is marking the last three notes, usually three syllables or words, as illustrated above. The preceding words of the phrase are all sung on the first ‘reciting’ tone. Anglican chant has two more notes in the second line, so the last five syllables or words are allocated their own notes. There are always four notes then six, making ten in all. Once you crack the code, it’s easy with a little rehearsal to agree on the flow of the words. The example shown below, for Psalm 79 by English organist C. Hylton Stewart (1884-1932), is a little different. It has two lots of ten notes so is a truly antiphonal song; verses are sung alternately, odds then evens, usually by two groups. Next ›Psalm 113, 18 Sep ’16 Alt.